Important Note: For the last several years we have been getting many requests for access to our portfolio models, indicators, and private client commentary. We are now going to offer a subscription-based service starting in the next few weeks in addition to our free site you currently enjoy. If you are interested in getting pre-launch information and “Founder Member” pricing, simply email us and we will put you on our notification list. Last week, we discussed the record-setting year of the market. Not only did the markets tie the most number of up years for any bull market in history, it also hit records for the longest streak without a 3% correction, lowest volatility, record margin debt and more. The exuberance that surrounded the markets going into the end of the year, as fund managers ramped up allocations for end of the year reporting, spilled over into the start of 2018 with the S&P hitting new record highs. Of course, this is just a continuation of the “stair-step” advance that has been ongoing since the Trump election. The difference this time is the extreme push into 3-standard deviation territory above the 50-dma that is concerning. But it isn’t just the 3-standard deviation above the 50-dma that is concerning, but rather the 3-standard deviation extension above the 50-MONTH moving average as shown below. That extension, combined with extreme overbought conditions multiple levels, has historically not been met with the most optimistic of outcomes. Importantly, such extensions have NEVER been resolved by a market that moved sideways. But, as I will discuss next, “exuberance” of this type is not uncommon during a market “melt-up” phase. As I noted last week, we did add some defensive positions to our portfolio allocations while we still retain a fully allocated long-position as well. These defensive “shock absorbers” are simply in place to reduce a volatility shock when, not if, one occurs. As prices rise, investors become more exuberant. The longer prices rise, without a correction, the more exuberant and confident investors become. The longer prices rise, without a correction and with very low price volatility, the more exuberant, confident and complacent investors become. The problem is that when investors are overly confident, exuberant and complacent, they unwittingly take on excessive amounts of investment risk without realizing the inherent danger. In other words, “investing mistakes” are covered up by steadily rising prices, but will be immediately exposed when prices reverse. Currently, with markets ratcheting up to new milestone marks on a continually faster pace, it is not surprising that as we turn the page into a New Year, investor sentiment has blown out to the upside. Individual bullishness, as measured by AAII, is now at the highest levels on record with a massive surge over the last two weeks. Professional investors, as measured by INVI, is also at a record. 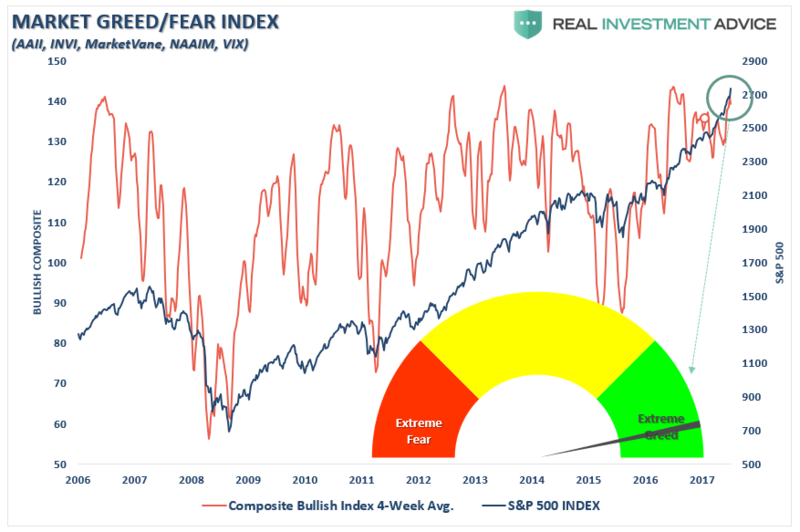 Even our composite fear/greed index which is a combination of AAII, INVI, MarketVane and the VIX is now also registering extreme greed on a rolling 4-week basis. 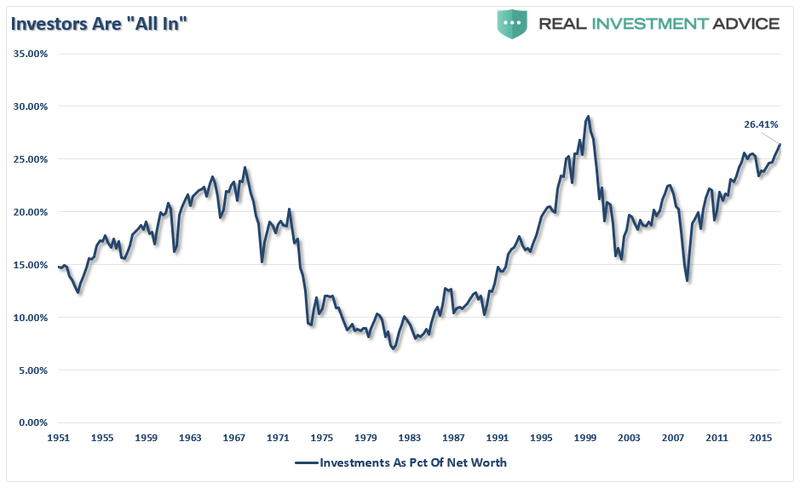 And, as I showed last week, not only is everyone now “all in,” they are doing so with record leverage. 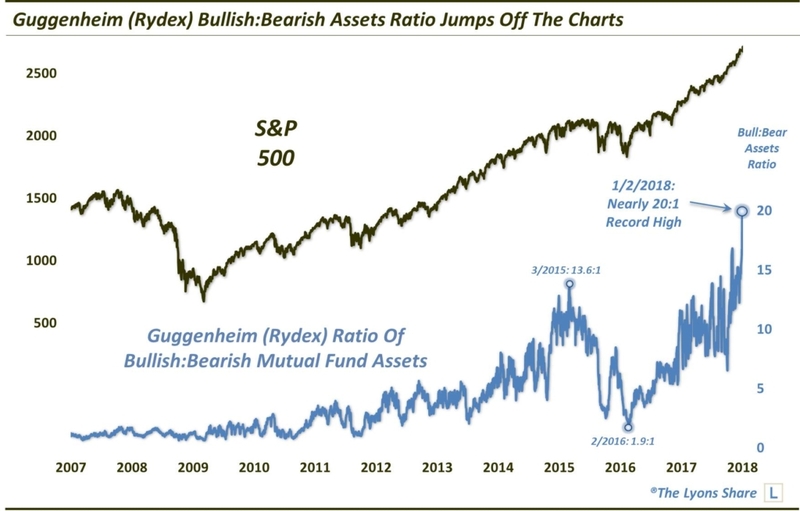 “It should be no surprise that this Rydex Bull:Bear asset ratio has risen to an extreme. However, the level to which it has risen in recent days is truly off the charts when compared with historical readings. As the following chart shows, up until 2014, the ratio generally ranged from about 1:1 to 5:1. In other words, when bullish assets hit 5 times the level of bearish assets, it could reasonably be considered an extreme. Near the market top in 2015, the ratio rose to a then-record (for the period shown, at least) 13.6:1. In the ensuing correction, the ratio dropped back under 2:1 briefly near the market lows in February 2016. Since then, the ratio has steadily climbed back up, reaching close to those 2015 highs on several occasions last year. So, one could certainly have argued that sentiment was back to bullish extremes on those occasions. While the levels of exuberance are quite astonishing, it certainly isn’t surprising. This is what has been witnessed during previous market “melt-ups” throughout history. 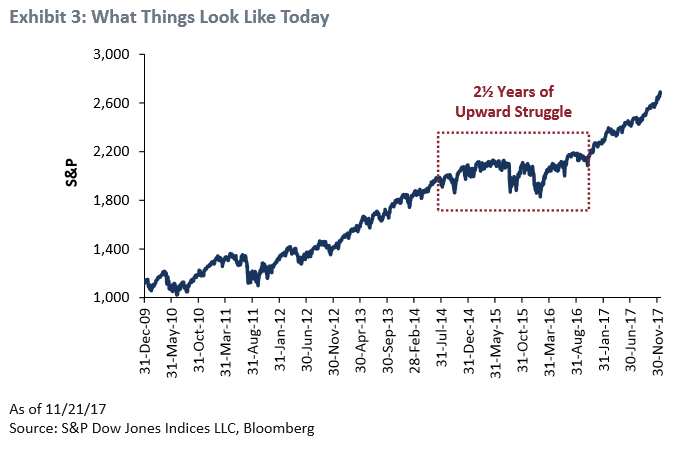 “As a historian of the great equity bubbles, I also recognize that we are currently showing signs of entering the blow-off or melt-up phase of this very long bull market. When most have talking heads yammering about Amazon, Tencent and bitcoin and not Patriot replays — just as late 1999 featured the latest in Pets.com — we are probably down to the last few months. Good luck. We’ll all need some. The classic examples are not just characterized by higher-than-average prices. Price alone seems to me now to be by no means a sufficient sign of an impending bubble break. 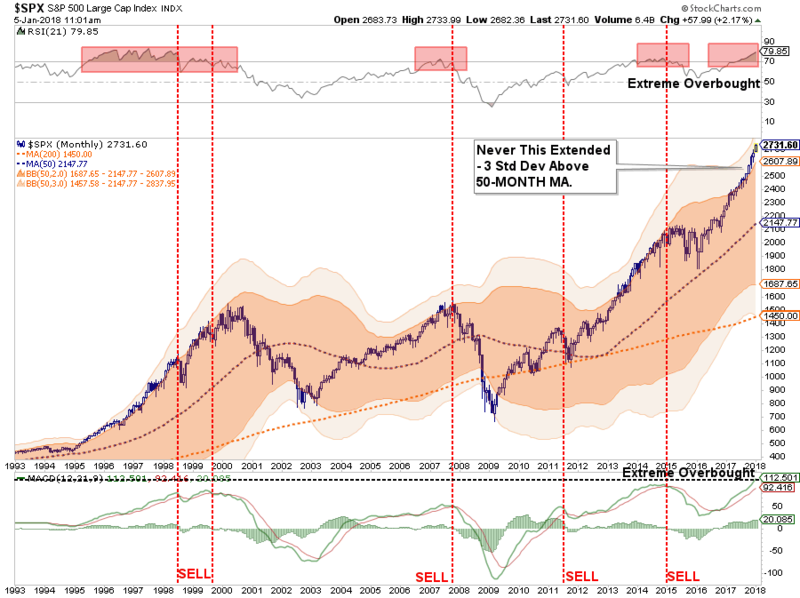 Among other factors, indicators of extremes of euphoria seem much more important than price. “Yes, there is a real danger of being late. And in general, average market declines are considerably faster than average advances. 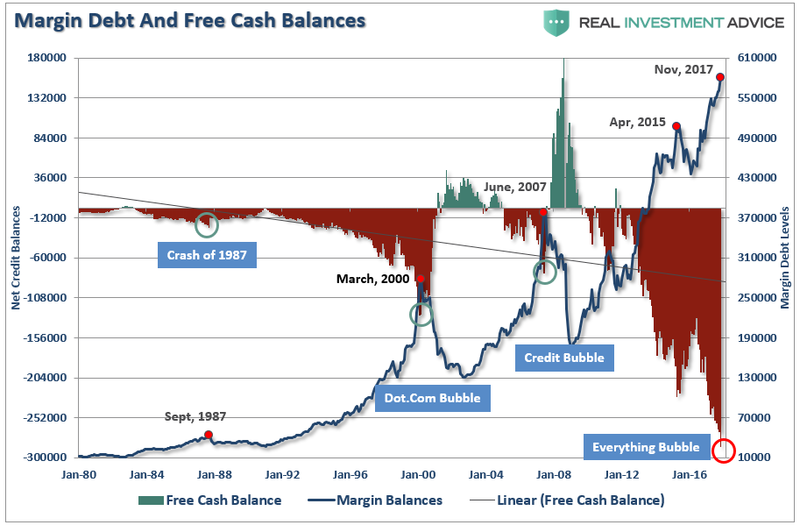 But historically, when dealing with real bubbles, being late has not been materially different in time and pain than being too early, as you can see. Value managers are historically painfully too early over and over again, as I know better than most. Grantham is certainly very correct in his analysis. However, as an investor, I certainly WOULD NOT complacently accept the notion that a rise to 3400-3700 is set in stone. Nor would I be overly confident this bull market has another 18-24 months in it. 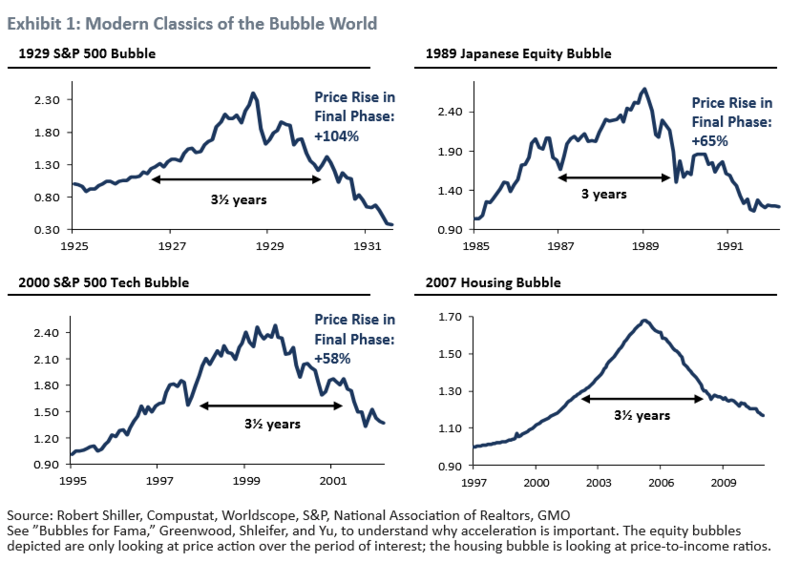 There are many factors from economic, monetary, geopolitical, and financial which have ignited each bubble, and bust, period throughout history. However, each bubble had in common the same extreme levels of confidence, exuberance, valuation and price extension that we see today. And they all ended the same, as well. Again, our portfolios remain on the long-side for now. However, as I will discuss below, we are also starting to add hedges and looking for additional opportunities to de-risk portfolios as prices continue their exuberant press higher. As discussed above, the current market advance both looks, and feels, like the last leg of a market “melt up” as we previously witnessed at the end of 1999. How long it can last is anyone’s guess. However, importantly, it should be remembered that all good things do come to an end. Sometimes, those endings can be very disastrous to long-term investing objectives. This is why focusing on “risk controls” in the short-term, and avoiding subsequent major draw-downs, the long-term returns tend to take care of themselves. For now…the bulls remain clearly in control…and they are charging. Every Sector Except Utilities – were in full-fledged party mode over the last week as the chase for new-year positioning took hold. The massive overbought conditions in discretionary, staples, materials and industrials need to be trimmed off. Financials and Health Care are extremely overbought as well. Look to rebalance risk next week on any showing of weakness. Energy – as I noted in December, the positive backdrop developed in the energy sector on a technical basis. We added one-half of a tactical trading position to portfolios last month which has paid off well. However, that trade has gotten way over-extended so look to take profits on any weakness. We are moving up our stop-loss levels as well. Utilities, we remain long the sector for now and added some weight to the sector as a hedge against a risk-off rotation. With the sector very oversold, look for a risk-off rotation before months end to see a pick-up in the sector. Small and Mid-Cap stocks continued their post-tax reform rally. Trends are positive which keeps allocations in the markets but the extreme overbought conditions make adding exposure here riskier. Look for weakness to take profits and rebalance weights in portfolios. Emerging Markets and International Stocks had shown some weakness temporarily heading into the end of the year. However, that was quickly reversed this past week as both surged higher. We remain long these markets for now but have moved up stops accordingly. Hold positions for now and look to rebalance on any weakness. Gold – Gold had failed to hold above the 50-dma and sharply violated the 200-dma a couple of weeks as bullishness over the market erased concerns of the need for safety. Interestingly, despite the complete lack of “fear” in the market, gold surged higher over the last couple of weeks which kept the 50-dma crossing back below the 200-dma. With Gold once again extremely overbought, the surge higher, and technical improvement, has now put it back on our watch list for an addition to the portfolio. S&P Equal Weight & Dividend Stocks – As noted previously, both of these positions have simply gone parabolic as money is chasing yield currently. We have moved up stops and are looking to take profits and rebalance accordingly. Bonds and REIT’s – With“tax reform” being passed by the Senate, rates finally ticked up which punished bonds and REIT’s in the short-term. 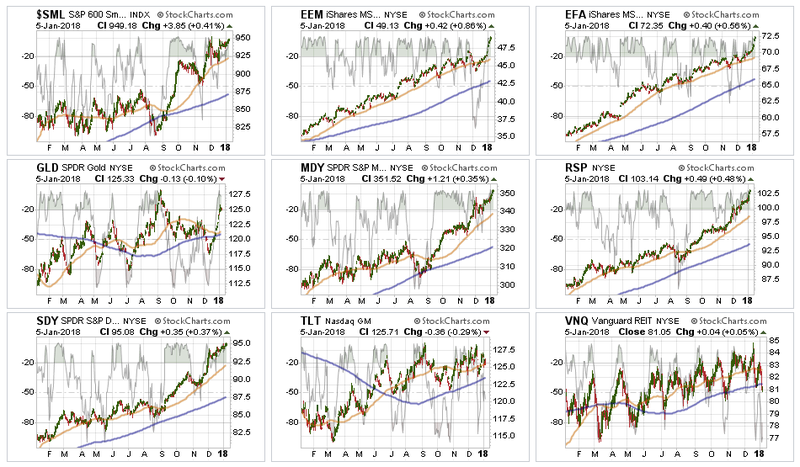 We remain long these sectors and did add to them recently on weakness as a hedge against a “risk off” rotation. As noted, we added 1/2 of a tactical trading position in Energy four weeks ago after an improvement in performance and recent bullish change in the technical underpinnings. We remain invested but are becoming highly concerned about the underlying risk. Our main goal remains capital preservation. However, the bullish backdrop remains intact but extensions are getting way out of hand here. While portfolio allocations remain at target levels, for now, the time for complacency is now gone. 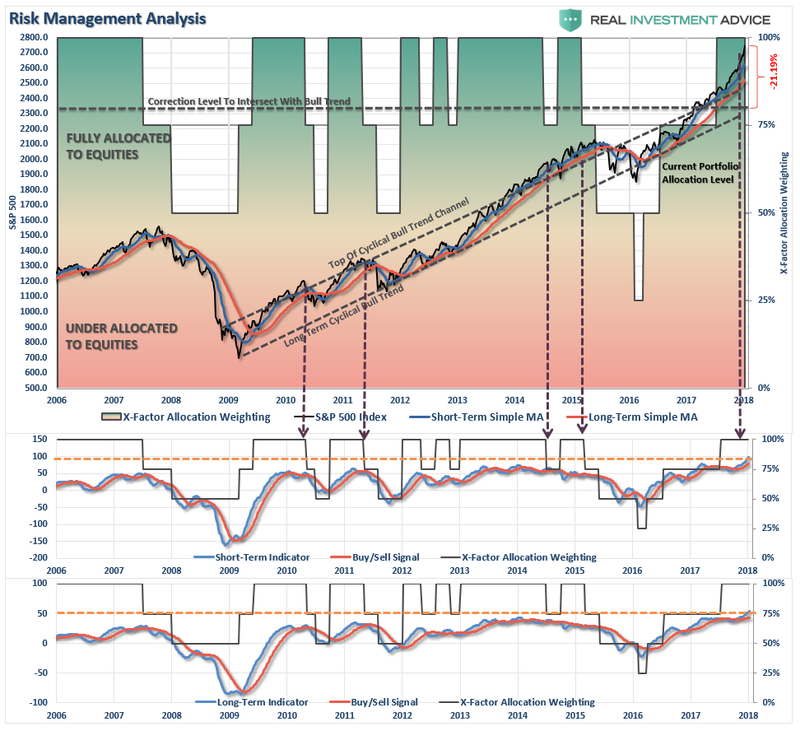 I have added a couple of notations to the 401k plan manager graph above. The markets have now pierced the top of the long-term bullish trend channel, which only happens either at the peaks or troughs of a market trend. Secondly, as noted by the arrows, with the markets extremely overbought and extended, risk outweighs reward at this juncture. Given the inability to hedge 401k-plans, I continue to recommended rebalancing risks in portfolios by trimming overweight equity exposure and adding to fixed income exposure. All NEW contributions to plans should currently be adjusted to cash or cash equivalents like a stable value fund, short-duration bond fund or retirement reserves. We will use these funds opportunistically to add to weightings when corrections occur.